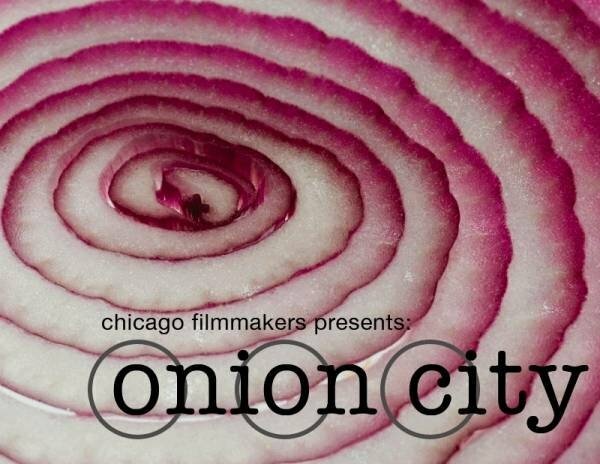 Chicago Filmmakers announces the call for entries for The 25th Onion City Experimental Film and Video Festival. Onion City will take place September 5-8, 2013. Onion City is one of the premiere international festivals exclusively devoted to experimental film and video. Onion City was founded in the 1980's by the Experimental Film Coalition and run by them for many years. Chicago Filmmakers assumed responsibility for the festival in 2001, and expanded the size and opened it up to video work as well as film. It is generally 8-10 programs over four days and features roughly 60-70 works from around the world. Aside from the competition programs, there are occasional special presentations of new or old films of note or guest presentations. Screenings take place at Chicago Filmmakers and other venues around mid-June. The mission of Onion City is to provide local and regional audiences with an opportunity to view a wide variety of contemporary experimental works, focused on artistic excellence but also with an eye towards representing differing styles, forms, and nationalities. Please read the festival regulations and entry procedures below. Contact Festival Director and Programmer Patrick Friel at [email protected] if you have any questions or concerns. You can also enter (with a discount) through Withoutabox at www.withoutabox.com beginning in mid-June. Please fill out the entry form completely and sign it. A separate entry form is required for each title. In addition to your entry, please enclose a description or synopsis of your entry along with a short biography for the film/video maker(s). We strongly encourage you to include at least one digital image (or indicate that these can be emailed or downloaded). Please also send any press kits, reviews, or publicity materials you might have. US ENTRANTS: Please enclose a non-refundable entry fee (check or money order in US Dollars only) for each entry, made payable to "Chicago Filmmakers." $25 for the first entry and $5 for each additional entry by the same entrant. INTERNATIONAL ENTRANTS: Free (international entries are free due to the much higher shipping costs and the excessive cost and hassle of getting international money orders). Any experimental works completed between 2010 and 2013 are eligible. No length restrictions. Chicago premieres are highly preferred but not required. Onion City is not accepting submissions of installation and other gallery-based work. Entries should be submitted for preview on DVD or BluRay (any region; NTSC or PAL; no DVD+RW), digital file, or online preview; contact Onion City if you prefer to submit film prints for preview. Note: preview copies will NOT be returned (except for film prints - contact Onion City before submitting film prints). If your work is available online in a high quality streaming format, you can submit as a link. Note that if you submit this way and are selected for the festival you may still have to send a DVD or tape for promotional purposes and a proper exhibition format. Acceptable formats for exhibition include: FILM - 35mm, 16mm and Super-8mm; VIDEO - DVD (no DVD+RW), BluRay, and Digital File. Foreign language work must be subtitled in English. By entering the festival, the entrant authorizes a public screening of the work in the festival and agrees to provide an exhibition copy for the period of the festival (September 5-8, 2013). Should the distribution rights for the work change by the time the festival takes place, it is still the responsibility of the entrant to provide an exhibition copy to the festival without charge. Once a film/tape is submitted for entry, it may not be withdrawn. Additionally, the entrant authorizes the festival to make copies of their preview copy for press use. If your entry is accepted for exhibition you will be notified by August 2, 2013. If your entry is not accepted for exhibition you will be notified by August 5, 2013. These dates are approximate and may change. If your entry is accepted for exhibition, your exhibition film or videotape should arrive in our office by August 16, 2013. Please inform us if this will be a problem. Exhibition copies will be returned to the entrant by September 27, 2013 unless we are requested in writing otherwise. Transshipments of exhibition copies to other U.S. festivals must be requested in writing. Onion City cannot transship to other international festivals. The festival will award cash prizes to films and videos selected by our jury. Exhibition copies must be sent to the festival prepaid. Return shipping via UPS or US Mail will be covered by the festival. Additional charges for express shipping or transshipments to foreign film festivals must be paid by the entrant or the recipient. The festival cannot accept nor assume responsibility for damage or loss of materials while in transit. All film reels, cans, discs, and cases must be labeled with the title of the entry. Please do not use fiber filled shipping envelopes; fibers damage videotapes and equipment. Foreign entries must be shipped prepaid. Exhibition copies must be sent directly to the festival office with all transportation charges, delivery fees, and any duties or taxes prepaid by the shipper. The entrant will have to bear financial responsibility in the event that the festival is charged any brokerage fees. Please be sure to include all proper customs documentation. We recommend that the following declaration be printed on the outside of the package and on customs forms: TEMPORARY IMPORTATION – FOR FILM FESTIVAL EXHIBITION ONLY. NO COMMERCIAL VALUE. Exhibition copies will be returned to the entrant at the expense of the festival.